Apple on Tuesday expanded its iWork productivity software suite to the iPhone and iPod touch, bringing Pages, Keynote and Numbers from the iPad. Pages, Numbers and Keynote (iTunes links) are now universal applications available for both the iPhone and iPod touch. For those who already purchased any of the iWork applications for the iPad, which are still available for $9.99 each, the software is available as a free update through the iOS App Store. Created for the Mac and then completely redesigned for iOS, Keynote, Pages and Numbers allow users to create and share presentations, documents and spreadsheets on the go. Keynote, Pages and Numbers import and export documents from iWork for Mac and Microsoft Office; print wirelessly using AirPrint; and include Apple-designed themes and templates. All iWork apps now include improved document management with thumbnail images that let users find files quickly, organize them and group them into folders using gestures. 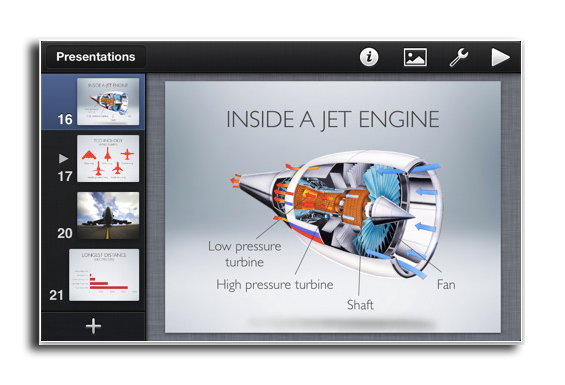 From the Tools button in the toolbar, users can share any presentation, document or spreadsheet without leaving the app. Keynote comes with with animated charts and transitions. Users can play a presentation in Full Screen view on the high-resolution Retina display or connect to a projector or HDTV for a large audience. Available separately, the Keynote Remote app allows an iPhone or iPod touch to control a Keynote presentation on any iOS device or Mac. 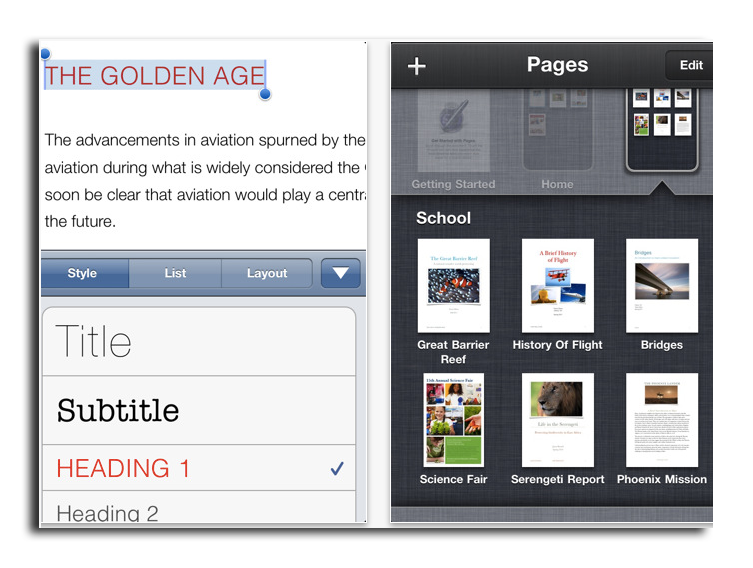 Pages takes full advantage of the high-resolution Retina display on iPhone 4 and iPod touch so users can see all the detail of their documents. On the smaller screen of the iPhone and iPod touch, Smart Zoom automatically zooms in to follow the cursor when editing, and zooms back out when finished. 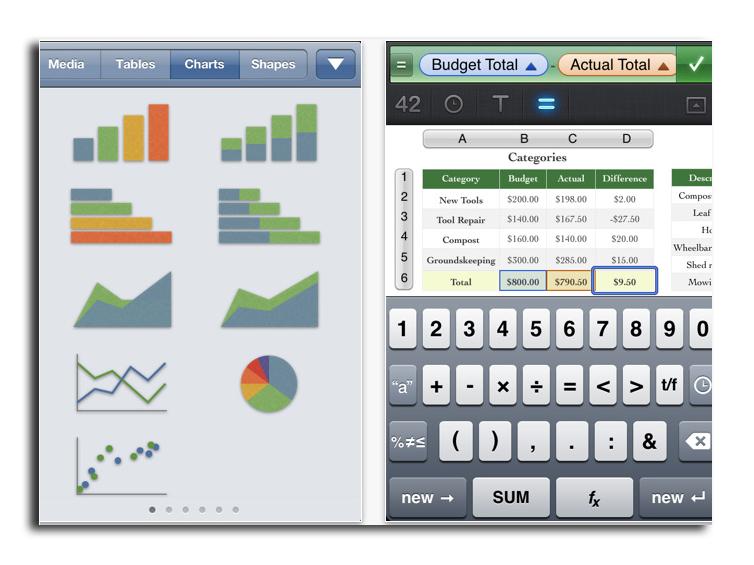 Numbers uses Multi-Touch gestures and an intelligent keyboard to help create spreadsheets with over 250 functions, tables and charts. Just like Pages, Numbers takes advantage of the high-resolution Retina display and Smart Zoom on the iPhone 4 and iPod touch. Keynote, Pages and Numbers are universal apps that run on iPad and iPad 2, iPhone 3GS and iPhone 4, and iPod touch (3rd & 4th generation). Keynote, Pages and Numbers are available from the App Store for $9.99 (US) each for new users, or as a free update for existing iWork for iPad customers. Keynote Remote is sold separately via the App Store for 99 cents (US).